President Xi Jinping Praises President Bio. China and Sierra Leone Sign new bilateral agreements. President Xi Jinping Hosts President Bio for State Dinner. 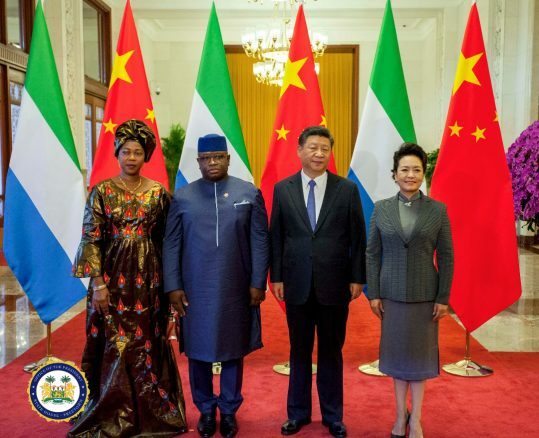 Beijing, China, Thursday 30th August 2018 – During the welcome ceremony, Presidents Bio and Xi signed new bilateral agreements between China and Sierra Leone. The first State Visit by His Excellency President Julius Maada Bio to the People’s Republic of China has so far been a remarkable success. 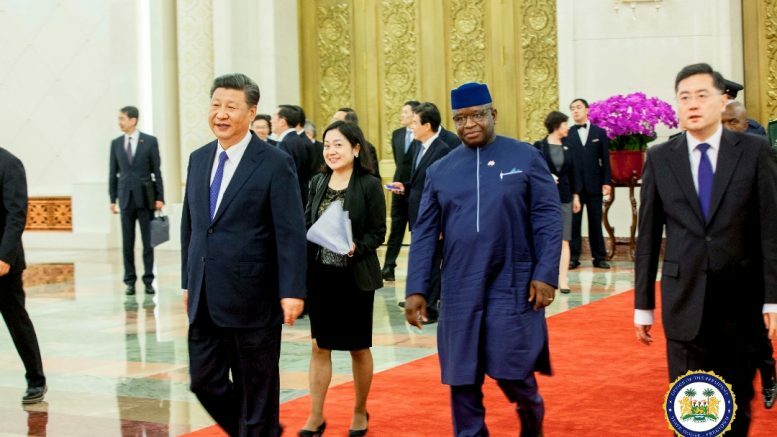 At the welcome ceremony in Beijing, the President of the People’s Republic of China praised His Excellency President Bio for his leadership and commitment to strengthening the bilateral relations between China and Sierra Leone. “We are prepared to work with your new Government to deepening the ties with Sierra Leone,” President Xi Jinping assured President Bio. President Xi Jinping also used the welcome ceremony to brief President Bio about the FOCAC Summit in which he said that the Summit aims to build a shared future between China and Africa. “I will like to work closely with you for the success of the FOCAC Summit,” President Xi Jinping told President Bio. In his response, President Bio thanked President Xi Jinping for the invitation and warm hospitality accorded to him and his entire delegation since their arrival. He expressed gratitude to the Government and People of China for the support China has given Sierra Leone, especially in difficult times. “Since the establishment of bilateral diplomatic relations about 47 years ago, our two countries have shown mutual understanding and support on issues related to our core interests and major concerns. Our two countries have always stood together at all times,” President Bio told President Xi Jinping. During the welcome ceremony, Presidents Bio and Xi signed new bilateral agreements between China and Sierra Leone. A Memorandum of Understanding on cooperation within the framework of the Belt and Road Initiative and an agreement on the economic and technical cooperation with gratuitous assistance from the Chinese Government of 250 million RMB Yuan. After the signing of the bilateral agreements, President Xi Jinping also hosted President Bio for a colourful State Dinner with live band performance. Earlier, President Bio was given a guard of honour accompanied by President Xi Jinping at the Great Hall of the People. The impressive welcome ceremony including the State Dinner and the new bilateral agreements demonstrated that President Xi Jinping and President Bio represent the new China-Africa partnership. 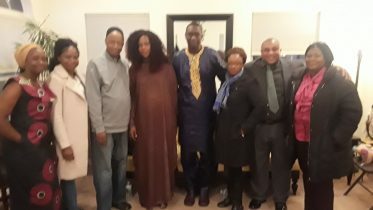 Despite the considerable significance of the State Visit and FOCAC Summit, His Excellency President Julius Maada Bio continues to demonstrate fiscal discipline by travelling with a lean delegation for the State Visit and FOCAC Summit. 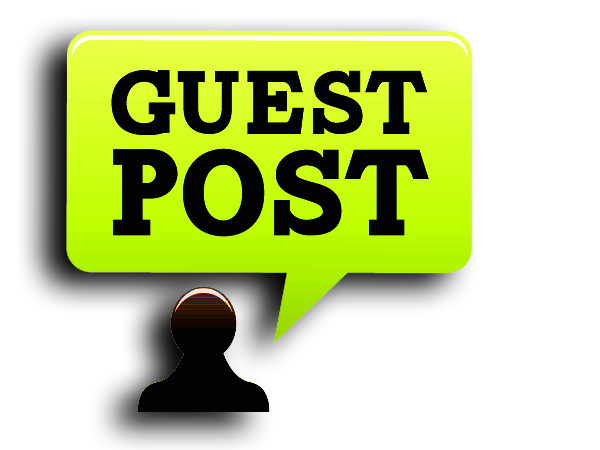 Be the first to comment on "China and Sierra Leone Sign New Bilateral Agreements"